It is fun picking out themes and making costumes for Halloween. It all started two years ago with Little Bo Peep and her sheep followed by the Hey Diddle Diddle nursery rhyme last year. Before that, they were ducks and then raccoons. 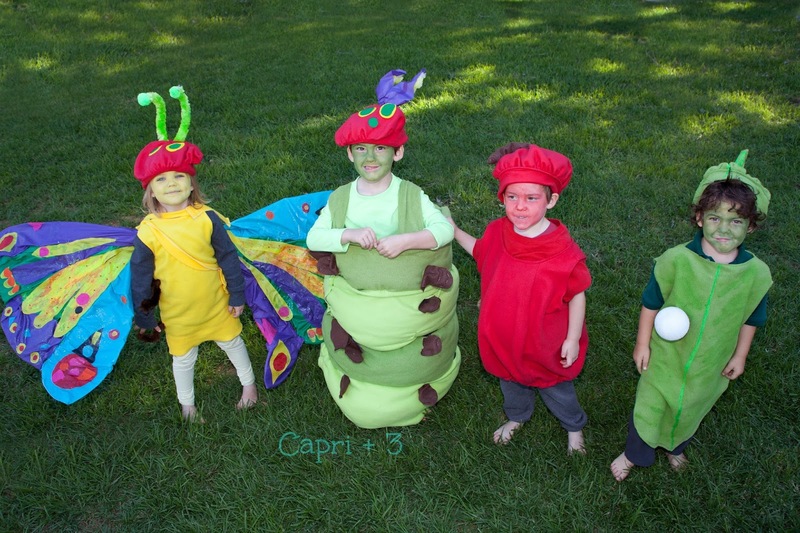 Since they have always loved The Very Hungry Caterpillar it was the perfect theme for this year. When we went out in the community, Ryder (the caterpillar) enjoyed it when adults would give him candy and say, “you must be VERY hungry! Once again, we did a photo shoot with Mia of Mia Z. Photography. She is a Mama of twins and is wonderful with kids. She does amazing headshots for children who are pursuing acting and modeling. As a bonus for us, her twins were there and entertained the rest of our kids while she did individual shots. They all talked about how much they liked ‘Miss Mia’s kids’ on the way home. All photos in this post are by Mia Z. Photography. The costumes are all homemade. Greg made the structure for the wings and I did the wing décor. 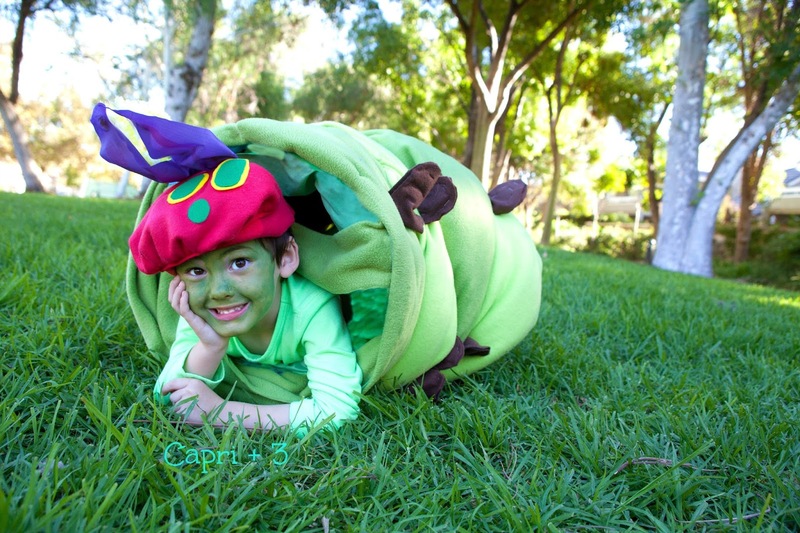 He made the caterpillar body and I made the rest of the costumes and hats. It is a fun and interesting challenge each year to bring a new theme to life. The kids love it and happily go along. When we talked about the theme, Xayden looked through the book and decided that he wanted to be a leaf. We added an egg to the leaf to go along with the story. Grayson decided that he wanted to be an apple because there is only one apple in the story. This picture cracked us up because it suits Grayson well as he is our intellectual ‘mini adult’. We have titled it The Thinker as it reminds us of the famous statue. 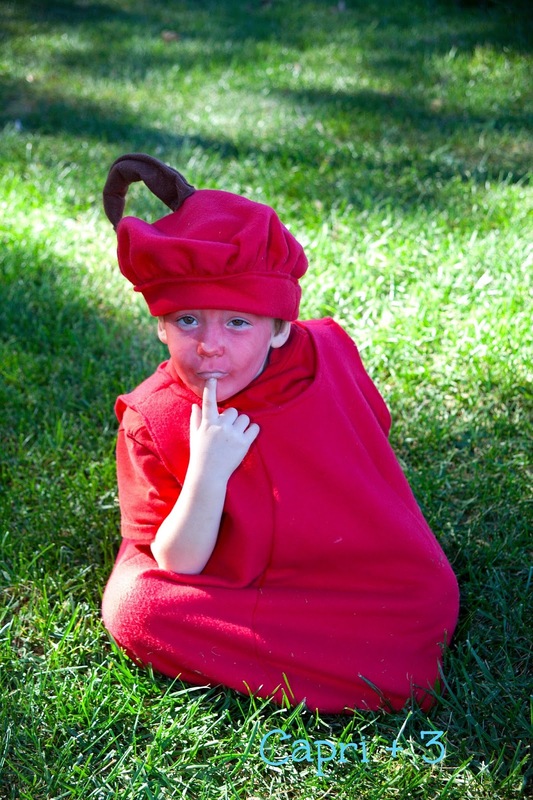 When we went out one day in costume and someone, unfamiliar with the Very Hungry Caterpillar, said, “Look. It’s all the stages of a butterfly and a ladybug,” as he rode by on a bike. Grayson called after him, “I am NOT a ladybug! I am an apple!” This really cracked us up. 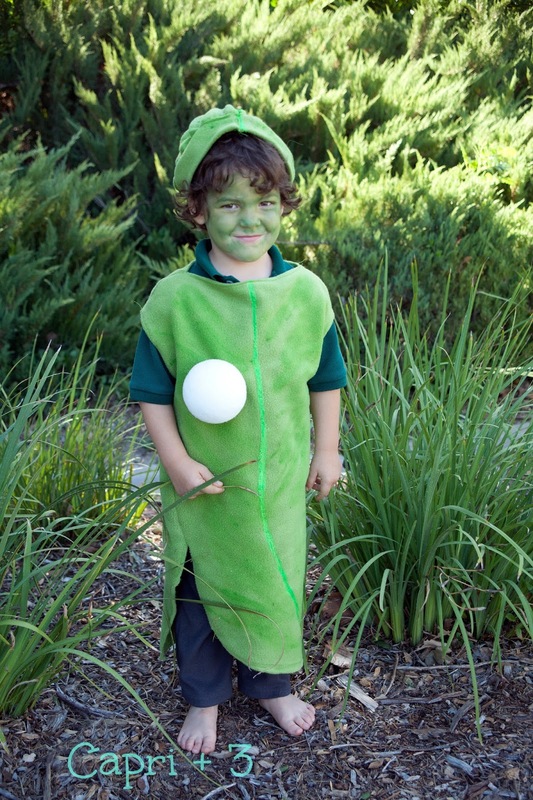 Ryder enjoyed being the main character in the Very Hungry Caterpillar. 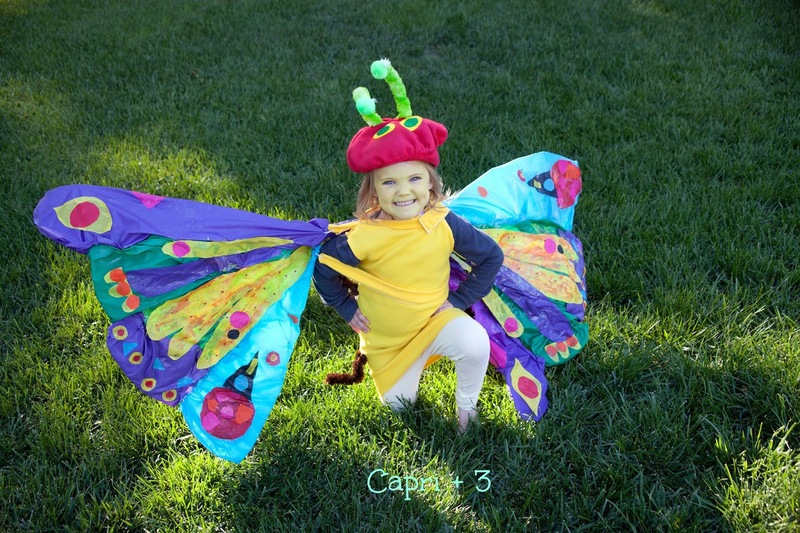 Capri spent much of her time in this costume singing about being a butterfly and dancing. She loved having the large colorful wings and was really enthusiastic during all the stages of wing construction. If you are interested in trying this theme in the future, I will be posting a tutorial on how to make a the caterpillar and butterfly hats. Have you done any costume themes in your family? I’d love to hear about some of your favorite costumes your kids have worn (theme or no theme). If you don’t own a copy of The Very Hungry Caterpillar by Eric Carle, I highly recommend it. It is so fun for kids to see the caterpillar eat through a variety of foods leaving a hole in each one. Those are so cool! We do family costumes every year! I love coordinating themes! Family themes are a lot of fun. I would love to see your themes! Feel free to add a link to yours. wow! I am so impressed you guys made those costumes! 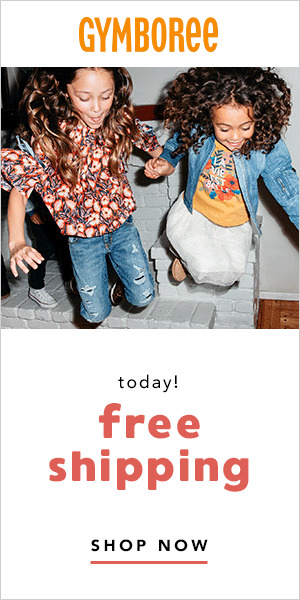 They are adorable and so are your kids! Thank you so much MaggieMaysGifts! These costumes are fantastic! I can't believe you made them. Great job momma! Such a perfect theme. It was fun trying to figure out how to bring this theme to life. Oh my GOODNESS! What an adorable costume! I love it! They had a lot of fun wearing them. This has got to be the most adorable and creative group costume!! We love that book and this makes me wish (just a bit) that I had more kids to do this with! Our kids had a lot of fun with it. It has been fun coming up with group themes that fit their interests and personalities. They are amazing!!!! I came upon your site because my 3 year old wants to be the butterfly and wants her baby sister to be the caterpillar. And NO one is selling these costumes. Did you put up the tutorial? thank you. did you make the pattern on both sides?